When Larry Hemmerich’s yacht arrived at Port Everglades, Fla., on Feb. 23, he took a photo of the custom 37-foot Down East-style lobster yacht on the deck of the bulk cargo carrier Vesuvius, little knowing that a few hours later U.S. marshals would “arrest” Knotty Dog and five other yachts as they came off the ship. Filings in U.S. District Court in Miami tell the story. Hemmerich and the other boat owners had paid Yacht Path International, a Fort Lauderdale, Fla.-based yacht transport service, a total of $300,000 in freight charges to ship the yachts, but Yacht Path failed to pay the money to BBC Chartering and Logistic GmbH & Co., the company that chartered deck space on Vesuvius for the six yachts. BBC filed a lien against the yachts, which included a 120- and a 145-foot Christensen, and the marshals seized them at the dock. They were put in the custody of National Maritime Services, an affiliate of National Liquidators, a Fort Lauderdale yacht auction and liquidation company, until the lien is satisfied. Hemmerich says each of the yacht owners had to repay their share of the freight charge, plus attorneys’ fees, U.S. marshals’ fees and storage charges, to get their boat out of hock. For the Hemmerichs, that meant paying $21,000 over and above the $20,000 they’d already spent to ship Knotty Dog. Hemmerich figures he spent probably another $40,000 on travel, hotels — the boat arrived in Port Everglades almost two weeks late — and two weeks’ worth of yard bills to repair damage Knotty Dog sustained in transit. Additionally, Hemmerich says, he had been promised an early December loading date for the yacht in Victoria; the boat did not load until Jan. 24. The owners of the yachts shipped on Vesuvius are not the only ones who suffered this nightmare. On Feb. 16, the Federal Court in Vancouver, British Columbia, issued warrants for the seizure of four yachts arriving that day in Vancouver on the M/V Star Laguna. Again, Yacht Path had failed to pay the freight charge, not just for those yachts but also for a number of others that had been unloaded from the Star Laguna at previous ports of call, according to Vancouver lawyer Chris Giaschi. So the shipper, Grieg Star Shipping AS, placed a court-ordered lien on the boats that were unloaded in Vancouver. He says Grieg Star is demanding that the owners of the four seized yachts pay $380,000 — the full freight bill for all of the yachts Star Laguna was carrying — to satisfy the lien. Again, Giaschi says, the boat owners had prepaid their freight charges to Yacht Path and were being asked to pay it again, plus the other boats’ fees. In mid-March the matter was in negotiation. Meanwhile, the freight carrier Billesborg arrived in Port Everglades the week after Vesuvius with another 16 yachts — 35- to 93-footers — whose transport Yacht Path had arranged. This time, Yacht Path sent an email to the yacht owners warning them their boats could be seized when they arrived unless they paid their freight charge (again) to satisfy a lien on their boats filed by the shipper, Nordana Project and Chartering. Robb Maas, a Palm Beach, Fla., lawyer who represented three of the Vesuvius yachts, worked with the 16 owners of the Billesborg yachts to pay the freight charge in advance of the yachts’ arrival so they would not be seized and incur more legal expenses. In an interview, Cummings says yacht owners have had to pay these extra freight charges because of a court judgment against Yacht Path for fees associated with an unsuccessful merger, which resulted in a writ of garnishment affecting all of the company’s working accounts. Cummings says his lawyers tried to negotiate a deal with creditor Henry Mandil, who won the writ of garnishment, and the banks to unfreeze the accounts. Meanwhile, Fort Lauderdale lawyer Robert McIntosh sent a letter advising clients of his who were involved in litigation with Yacht Path over their yachts to join in filing a suit to force the transport company into involuntary Chapter 7 bankruptcy. “If we force Yacht Path and Unity Shipping (Yacht Path’s sister company, responsible for logistics — the loading, sea fastening and ocean transport of the yachts) into involuntary bankruptcy, I believe the court would appoint a trustee who would look into the Yacht Path assets and hopefully bring them into the court for the distribution to Yacht Path creditors,” McIntosh’s March 6 letter concludes. To forestall that, Yacht Path and Unity Shipping on March 20 filed for Chapter 11 reorganization in U.S. Bankruptcy Court in West Palm Beach, Cummings says. “Without access to capital and with the threat of an involuntary bankruptcy hanging over us, we had no choice but to seek protection under Chapter 11,” Cummings told his clients in an email. Maas says it does not appear the frozen accounts are the sole reason for Yacht Path’s failure to pay its bills. Its bankruptcy filing lists more than $7.5 million in liabilities and no assets. It lists one secured creditor, Mandil, to whom the company owes $259,447. The 49 unsecured creditors include dozens of yacht owners or their representatives. McIntosh in his letter and Maas in an interview tell of voluminous litigation predating the yacht seizures that typically involve an owner paying Yacht Path a deposit or even the full freight charge to arrange a yacht’s shipment by a certain date, but the date comes and goes without the yacht shipping, Maas says. Sometimes the delay is months; sometimes the ship never comes. “Yacht Path doesn’t follow through. … The client has to make other arrangements.” And Yacht Path doesn’t refund their money. • Athit Apichari, a Thai national, seeking a refund from Yacht Path of an $8,000 deposit on a $40,000 freight charge, alleging that the company failed to ship a 39-foot Sea Ray from Port Everglades to Thailand by the date promised. • DOA Charter Ltd., of Malta, seeking a refund of a $65,855 deposit on a $131,710 freight fee from Yacht Path, alleging that it failed to ship the motor-yacht Ado from Egypt to Thailand by the date promised. • Dolphins Partners Ltd, seeking a refund of $113,838 in prepaid freight charges, alleging that Yacht Path failed to ship the motoryacht Stellar from Palma Mallorca to Port Everglades on time. • Magellan Management & Consulting America LLC, seeking the refund of $215,000 in prepaid freight charges from Yacht Path, alleging that it failed to ship the 161-foot Trinity motoryacht Glaze on time from Port Everglades to Genoa, Italy. • P.J. Pacific LLC, seeking a refund of $72,190 in prepaid freight charges from Yacht Path, alleging that it failed to ship the motoryacht Arrowhead from Cristobal, Mexico, to Victoria on the date it promised. In San Francisco, lawyer Rupert Hansen has filed suit against Yacht Path on behalf of Marin International Yacht Sales, alleging breach of contract, fraud and racketeering — violation of the federal RICO Act. The RICO charge alleges a pattern of “fraudulent” activity: taking yacht owners’ deposits — or in some cases the full amount of the freight charge to transport their yachts — failing to transport them on the agreed date, then keeping the owners’ money when they have to make alternative shipping arrangements. The suit alleges that Marin International paid Yacht Path $68,250 to transport Maximus II, a 105-foot Horizon, from Manzanillo, Mexico, to Victoria, where it was to be put in charter. A month after the agreed loading date, Maximus still had not been loaded or shipped, so Marin moved the yacht on its own bottom to San Francisco to try to pick up some replacement charters, according to the suit. The suit asks for $253,250, which includes the money Marin paid Yacht Path, $140,000 in lost charters and $45,000 in fuel costs, supplies, crew costs, insurance, and vessel wear and tear for the voyage from Mexico to San Francisco. In the RICO charge, the suit alleges that in addition to defrauding the owners of Maximus II, Yacht Path took money to transport two other yachts, the motoryachts Kay and Glaze, and failed to deliver them as agreed or return the prepaid freight charges. The case involving Kay was settled Jan. 30, according to documents filed in U.S. District Court in Miami, but it remained pending until Yacht Path followed through with an unspecified action. Cummings’ brother Kevin, Yacht Path’s vice president, responds that many of his clients don’t understand that Yacht Path does not have control over the ships’ schedules. They typically are “tramp” freighters operated by shipping companies that run irregular routes picking up freight as orders come in. Kevin Cummings says he can only offer clients a window of perhaps two weeks when a ship will arrive and load a yacht, but most of the suits say Yacht Path gave a specific pickup date that it did not come close to meeting. In the case of DOA Charter Ltd., of Malta, the captain of Ado entered into a contract with Yacht Path on Sept. 28, 2012, to ship the motoryacht from Egypt to Thailand for $131,710, according to a filing in U.S. District Court in Miami. DOA advanced Yacht Path about half that sum, with the stipulation that it would get a full refund if the yacht did not ship by Nov. 1, the suit says. As of Jan. 4, the yacht had not shipped, so the captain asked for a refund, which the suit says Dennis Cummings said he would provide. As of the date of the suit — Feb. 26 — there had been no refund. He says a flexible delivery schedule “is the only way this will work unless the yacht owner is willing to pay actual market rates for cargo.” Based on metric tons or volume, those rates “would be four or five times what we charge,” he says. As for delivery dates, he says he usually gives yacht owners a 15-day window, but they press for a best guess on a specific date. If he gives one, they take it as firm, he says. He says Yacht Path can’t give refunds without losing money because it commits to fill space on a ship six weeks in advance and must pay for it even if the ship is late. 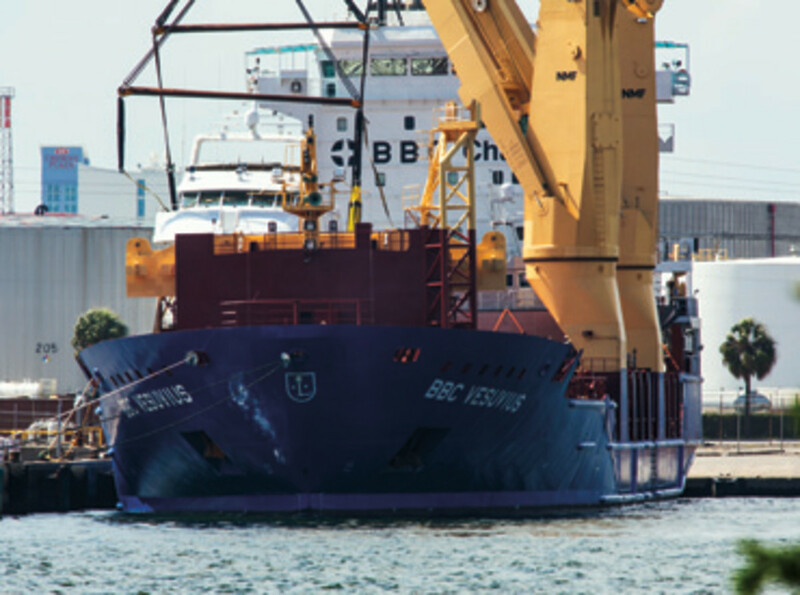 He says Dockwise Yacht Transport, the Fort Lauderdale-based company that uses mammoth semisubmersible carriers to transport vessels, is the only yacht transport company offering service dedicated exclusively to carrying yachts. It has two ships working the Mediterranean, the Caribbean, the U.S. East Coast, Australia and New Zealand. “They’re more expensive, and so you get a higher level of service,” he says. Netherlands-based Seven-Star Yacht Transport is Yacht Path’s main competition. Kevin Cummings says that if Yacht Path were to go out of business, it would have an enormous impact on the marine industry. “It’s going to be a sad time if 50 percent of the yacht transport business doesn’t operate anymore,” he says, because that will have a domino effect on international commerce in yacht sales and charters. Yacht Path has shipped 8,000 yachts since its organization as a New York corporation in 2001; its revenue in 2011 was $20 million, and it was $30 million in 2012, Kevin Cummings says. Bankruptcy filings list Dennis, Kevin and sister Colleen Cummings as owners of the business. Kevin Cummings says the company started on Long Island Sound, shipping yachts between Florida and New York, then expanded to shipping between Florida and Southern California — mainly sportfishing boats — where owners would pick up their boats and run on their own bottoms the 70 miles to Ensenada, Mexico, to fish.